Published Apr 13, 2016 by Addison-Wesley Professional. Part of the LiveLessons series. Cay S. Horstmann is a professor of computer science at San Jose State University and a Java Champion. He is also the author of Core Java®, Volume I–Fundamentals, Tenth Edition (Prentice Hall, 2016), Core Java® for the Impatient (Addison-Wesley, 2015), Java SE 8 for the Really Impatient (Addison-Wesley, 2014), and Scala for the Impatient (Addison-Wesley, 2012). He has written more than a dozen other books for professional programmers and computer science students. 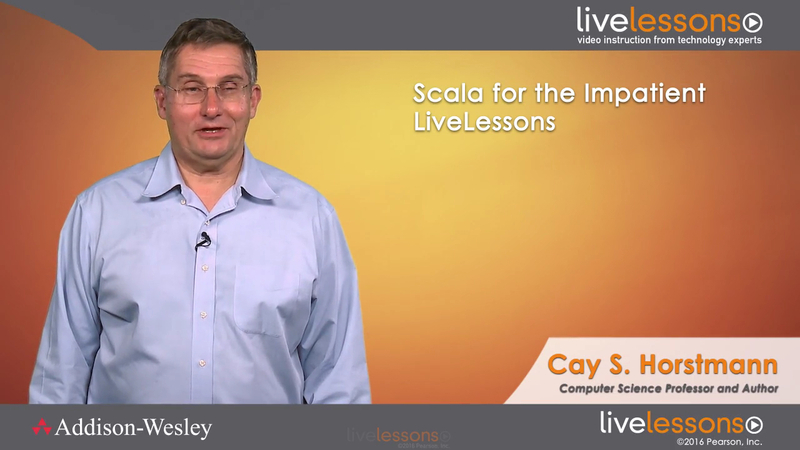 Lesson 4: OOP1—Classes and Objects discusses object-oriented programming in Scala. Scala is a hybrid language, and object-orientation is one of its cornerstones. If you dislike the boilerplate and ceremony that you need with classes and methods in Java, you are going to love what you see in this lesson: classes without the pain. You learn how to define classes and implement methods. In the lab, you explore how classes can evolve, while preserving a convenient interface for class users. Lesson 5: OOP2—Packages, Inheritance, and Traits covers advanced topics in object-oriented programming. You learn how the Scala syntax for packages and imports is more consistent and more convenient than the equivalent in Java. Then the lesson turns to inheritance and to traits, the Scala analog of interfaces. Like interfaces in Java 8, Scala traits can have methods, but they are even more dynamic than in Java. You explore some of their power in the lab. Lesson 7: Case Classes and Pattern Matching covers the powerful concept of pattern matching. Pattern matching enables you to write complex branches in an intuitive and concise way. You learn about case classes—classes with special features that make pattern matching work. As an example of case classes, you are introduced to the Option type, a better alternative to null values. The lesson ends by contrasting pattern matching with inheritance and polymorphism. In the lab, you put pattern matching and the Option type to work.